Balkan Terrorists Target Euro Police Convention — 1389 Blog - Counterjihad! Dr Darko Trifunovic has been conducting research into the origins, ambitions and operating methods of what he calls “white Al Qaeda”, the home grown branch of the terrorist franchise organization in the various areas of the Balkans. It first took foothold in Bosnia-Herzegovina after the Western powers in the 90’s saw the influx of Afghan war veterans into the territory as an easy way to support the Bosnian Muslims. Since the Dayton Peace Accord Iranians as well as Saudi Wahhabis have flooded the statelet with funds, over-sized mosques and subversive organizations, one of which has members throughout the Bosniak diaspora in Europe, Canada and the US. One such is CNAB, the center of gravity of the present threats against Trifunovic. Trifunovic has also found new links between Bosnia and the terrorist attacks of 9/11 and the London and Madrid train bombings. Specifically mentioned are Mohammed Atta, who coordinated the 9/11 outrage, and Khalid Shaikh Mohammed, Bosnian citizenship holder and war veteran, former Al Qaeda ‘Operations Chief’, who – according to Dr Darko Trifunovic – took over the leadership of the Al Qaeda media campaign (‘the Committee’) during the planning of the 9/11. Atta’s place of residence was a Bosnian hamlet before launching off to Hamburg and the US for his fatal mission. With the knowledge of the UN interim governors in Kosovo, Albanian-American radicals were actively recruiting terrorists for ‘the war against America’ prior to the 9/11 attack, of which they had foreknowledge. The UN however, did nothing. The Foreign Area Officer Association FAOA posits that the Sarajevo based organization, AIO’s (Aktivna Islamska Omladina) “(…) Islamic weekly magazine SAFF  and organization’s website have been fronts of radical Islamic preaching, gaining notoriety for publishing interviews with terrorists who have fought against US forces in Iraq and expressing solidarity with the jihadists and suicide bombers in Israel.” FAOA also links the AIO with members throughout the Bosniak diaspora in Europe and the US, one of which is the CNAB, now the center of gravity, threatening Trifunovic. 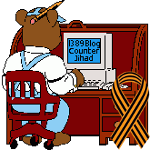 “Here is why Bosnjaci.net, an Islamist web site from Bosnia is attacking me. One of Bosnjaci.net‘s favorite and honored members is Sakib Mahmuljin, who is a high-ranking Bosnian White Al Qaeda member, accused of war crimes. See this: “War crimes: “Vozuca case”, six years later”. Izet Nanic is a former commander of the 505th Buzim Brigade with the Fifth Corps of the Bosnian Army which was an integral part was the “Hamze” unit. See here and here. Another prominent individual on Bosnjaci.net is Nezim Halilovic-Muderis. He is imam at the Wal-Mart-sized, Wahhabi King Fahd mosque, which opened in 2000 on the outskirts of Sarajevo, built with Saudi money and named after the Saudi monarch. Nezim Halilovic-Muderis, a Bosnian extremist agitator whose antics I have been following since 1999. Muderis’s Friday sermons, available on Bosnian websites, are replete with incitement to violence in Israel, Kashmir, Chechnya, Afghanistan, Iraq, Syria, and the Philippines. He preaches the same line on the U.S.-led coalition in Iraq, as is heard among the acolytes of the late terrorist leader of ‘Al Qaeda in Iraq’, Abu Musab al Zarqawi. It is, to say the least, bizarre: “In Falluja, according to statements from the U.S. command, spirits have appeared in the form of enormous spiders, weighing about a kilogram, that only attack U.S. soldiers, and the person who is bitten dies within seconds.” More information about this prominent Wahhabist is here. Another Bosnian Muslim war criminal, protected and promoted by Bosnjaci.net is Rasim Delic. According to the indictment, Rasim Delic was aware that the jihadi members of the Bosnian army had a distinct tendency to commit crimes, especially against captured enemy combatants and civilians (…) Reportedly, however, he took no measures whatsoever to stop these acts taking place. The manicheic character of the site is illustrated by the shocking death threats in one section, while another is reserved for “Dobri Bosnjaci” (good Bosniaks). The latter consists of a list of special members of the portal: dangerous Islamic fundamentalists and war criminals. Trifunovic: “We are dealing with pure criminals (…) I am planning to inform all EU, US and other relevant authorities regarding this unfortunate incident in order to prevent such thing from happening again in the future.” I don’t share his optimism. Up to now Dr Trifunovic has been able to conduct his investigations from the ivory tower of the University of Belgrade in relative tranquility. When it transpired however he was invited to speak during the upcoming 11th Police Congress and – as a consequence, the results of his research would reach the professional domain – no methods have been shunned to intimidate him, discredit him as a person and as a scholar. With false accusations of ‘Srebrenica denial’ and ‘hate mongering’ – references to laws prohibiting Holocaust denial and inciting racial hatred – attempts have been made to get him banned from the police convention; impersonations and cyber manipulation being but the least methods of choice to muzzle. But it is my understanding that, far from denying the deplorable events at Srebrenica, Trifunovic has been further investigating the matter. Let me wrap this up with some thoughts of my own. In the past few decades one of the greater mysteries has been the question, how the Holocaust on six million Jews at the hands of the Nazis could have taken place without the entire continent raising up in protest. At present, a sizable majority of people in the West surprisingly seem to be sharing views with the people who have declared against us. However treacherous and hard to fathom this may be, it is kinder on the persons harbouring such views: it is after all easier to be a voluntary accomplice – silent or otherwise – than it is to be a coward. As of January 13, the website bosnjaci.net, which is said to be an al Qaeda support forum, is no longer functioning. In place of the normal display is a message saying that the site is closed, and that the hacker attack took place because Darko Trifunovic had to cancel his appearance at the Euro police convention. We will continue to follow this story, which is proving to be very interesting indeed. Previous post: Is the Daily Kos’ Markos Moulitsas encouraging voter fraud?